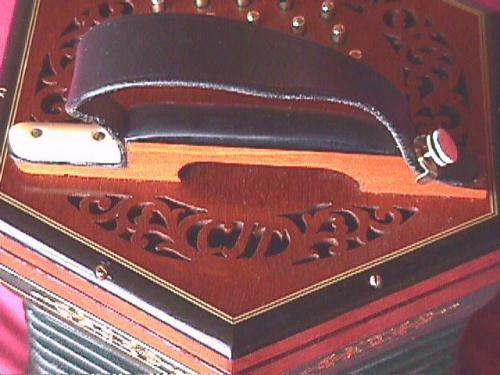 I am now lucky enough to be the owner of a magnificent hand-made concertina by C & R Dipper. 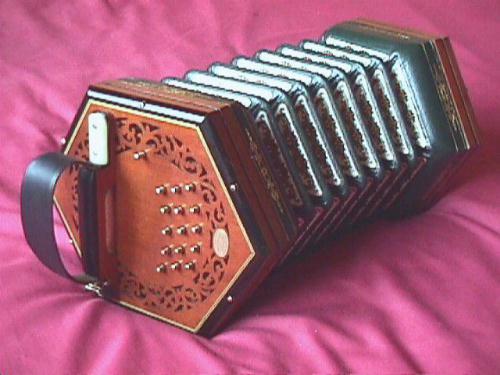 This instrument is a 30-button C/G baritone, meaning that it plays a full octave below the normal C/G anglo. It was made specifically for song accompaniment, so Colin has done everything he can to give it a deep, rich sound. It's a really beautiful instrument. 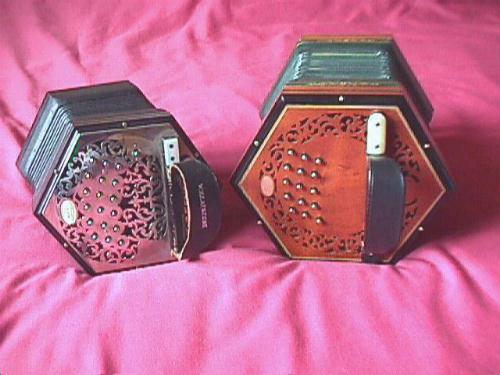 I met a chap once who had a Dipper Hayden duet concertina, who said to me with great emphasis "this is undoubtedly the best concertina ever made - ever made". I don't make such claims for this instrument, but it is at least possible that this may be the best anglo ever made for the purpose of song accompaniment. I feel very privileged to own it. This shows the new Dipper on the right, with my Dickinson C/G treble on the left for scale. This is the Dipper on its own. The ends are made from solid Spanish mahogany, originally from Cuba. The wood used here was recovered from a salvaged display cabinet originally made for the British Museum in 1868. The black wood on the edges is ebony. 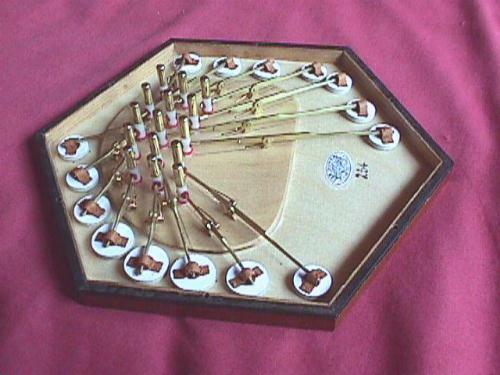 The bellows are green with green, brown and gold papers in an old Wheatstone pattern. A close-up of the fretwork, showing my initials (CJT) incorporated into the pattern. It also shows the distinctive Dipper cross-bar, higher and more confortable than the usual design. Here is the reed pan for the left hand (lower) end. 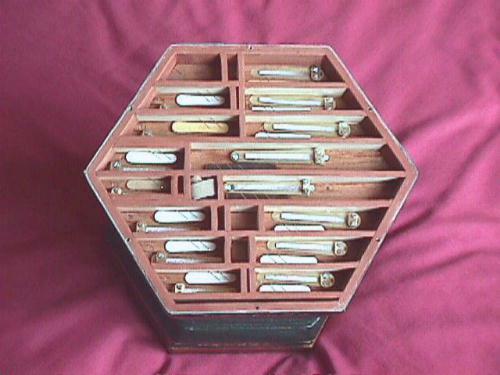 The reeds are very large and the chambers unusually deep, which all helps in making the sound rich and deep. Here is the reed pan viewed from the other side. 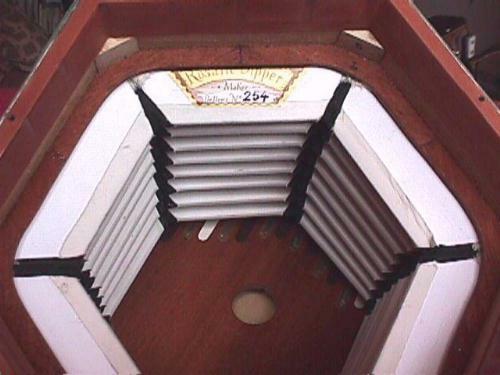 The interior of the bellows, clearly showing Rosalie Dipper's own maker's badge. Rosalie makes the bellows for all Dipper concertinas. Here is the riveted action. 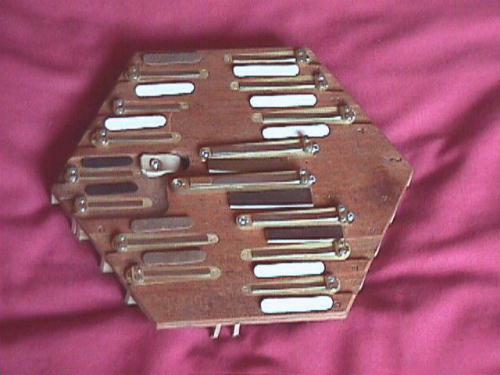 You can see the concertina number (254) and the buttons, which are brass cylinders mounted on delrin cores.